An expert in anti-terrorism tactics, hotshot LAPD officer Paul Cutler (Gabriel Macht) is ordered to Detroit to train its S.W.A.T. Team in the latest hostage rescue techniques. But everything changes when their botched response to a domestic dispute ends with a hostage down and a government assassin now obsessed with terminating him. While the average direct-to-video sequel follows its predecessor pretty rapidly, this didn’t happen with the SWAT franchise. 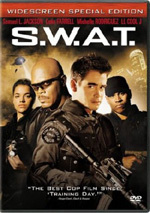 The original movie came out back in 2003, but SWAT: Firefight didn’t emerge until 2011 – and without virtually anyone associated with the first flick. That's not a great recipe for success, but I thought I’d give Firefight a look anyway. LAPD Sgt. Paul Cutler (Gabriel Macht) gets sent to Detroit and help train their SWAT team. He doesn’t view this as a peach of an assignment, but when given inducements, he heads to the Motor City. There he finds a less than tight SWAT squad – and resistance to his presence. Placed in charge of the team, he attempts to whip them into shape. 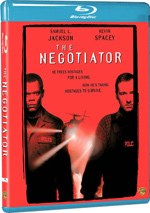 When they go out on a hostage call, the situation goes seriously awry. Walter Hatch (Robert Patrick) ends up in custody, but that’s not enough for his hostage (Kristanna Loken); she demands his death, and when the cops won’t allow her to shoot him, she kills herself. Hatch blames Cutler for her death and plans his revenge. Cutler must deal with this threat while he still attempts to prep his team for certification. When I go into a movie based on a TV series, I don’t expect much. When I go into a direct-to-video movie based on a movie based on TV series, I expect even less. Heck, that bar’s set so low that I’m amazed if the resulting flick is in focus. Which makes Firefight a pleasant surprise. I thought the 2003 flick was a disappointment; while I like action movies, it seemed like an uninspired Michael Bay wannabe without anything to elevate itself above mediocrity. At no point does Firefight approach greatness, but I don’t think it aspires to be much more than what it is: a moderately good little cop flick. I think the filmmakers understand what they’re being asked to do, and they manage to create a movie with some occasional senses of spirit and freshness. Some of that stems from the plot. On the surface, Firefight offers Speed without the bus: it gives us a vengeance-minded baddie who screws with a cop for his own purposes. That’s not the most creative concept, but Firefight uses it for some twists. The film doesn’t go down consistently predictable paths, so it delivers an intriguing ride. The film also doesn’t seem to take itself too seriously. All involved know this isn’t Hamlet; it knows that it traffics in clichés and doesn’t pretend that it plans to reinvent any wheels. How can I dislike a movie that casts a former Terminator as a stalker – and another one-time Terminator as the object of his obsessive desire? I think the actors help make the material enjoyable. In particular, Macht provides a good leading man. He delivers the expected heroic sensibility but he also portrays a believable sense of weakness. He and the others manage to deliver some hackneyed lines in a manner that improves them; the dialogue still seems awkward, but the performances blunt their clunkiness. On the negative side, Firefight embraces a few of the usual cop flick clichés, and director Benny Boom can’t resist camera gimmicks. He occasionally goes for a first-person-shooter style that made sense in Doom but just irritates anywhere else. Boom also gets into Michael Bay ever-spinning camera mode too often; the movie would work better with less hyperactive visuals. Well, I’m not sure. I guess they want their money, but they allow the frat boy to call the cops and tell them to “shoot these dicks”. The drug lord doesn’t seem to mind this, and he also gives the frat boy a gun! He drops the weapon as soon as the cops enter, and the drug lord barely puts up a fight. It’s a really strange scene that seems to be missing some footage that might allow it to make more sense. 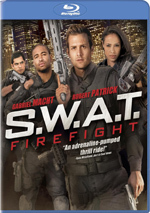 Still, I think SWAT: Firefight achieves its modest goals and works much better than the average direct-to-video epic. It provides a fairly entertaining cop flick that I actually like more than the original SWAT. Firefight won’t win any awards, but fans of this sort of police movie will probably enjoy it. SWAT: Firefight appears in an aspect ratio of approximately 1.78:1 on this Blu-ray Disc. This was a generally strong presentation. Sharpness looked solid. A few shots were slightly soft, though that usually seemed to stem from the documentary-style photography; it leaned toward iffy focus at times. Overall, though, definition was quite good. No jagged edges or edge haloes occurred, but some brief instances of shimmering came with the sides of a building. Source flaws were a non-factor, as the movie stayed clean. Like most modern action flicks, Firefight often favored a teal tint; other scenes went with a brownish overtone. These stylized colors weren’t overwhelming, but they were noticeable. Within their parameters, the hues appeared well-developed. Blacks seemed deep and tight, while shadows were decent; they could be slightly dense, but they remained positive for the most part. In the end, the transfer proved to be very good, if not great. As for the DTS-HD MA 5.1 soundtrack of Firefight, it was a peppy mix. With all the action scenes, we got a lot of good material from all sides. Gunfire, cars, explosions and helicopters zoomed around the spectrum and added a nice sense of activity to the film. Stereo music also worked well, and this turned into a pretty vivid soundscape. Audio quality seemed fine. Speech was crisp and distinctive, with no edginess or other concerns. Music was full and rich, while effects came across as lively and accurate. The track boasted good low-end when appropriate. All of this was good enough for a “B+”. Only minor extras show up here. Sharp Shooting: On the Set runs eight minutes, 43 seconds and includes notes from director Benny Boom, technical advisor Darcy Leutzinger and actors Matt Bushell, Shannon Kane, Kevin Phillips, and Micah A. Hauptman. The show looks at the story and changes made from the script, shooting in Detroit, training and attempts at SWAT realism, camerawork and some cast/character topics. With less than nine minutes at its disposal, “Shooting” can’t deliver a lot of depth. However, it’s pretty good given those restrictions; it packs a decent number of facts into its short running time. The disc opens with ads for Sniper Reloaded, Faster, The Hit List, Quarantine 2: Terminal, El Mariachi, Desperado and Once Upon a Time in Mexico. These also pop up under Previews. No trailer for SWAT: Firefight appears here. No one will ever mistake SWAT: Firefight for an action classic. Nonetheless, it overcomes a mix of clichés to become a fairly entertaining action flick that doesn’t take itself too seriously. The Blu-ray presents very good picture and audio but lacks significant supplements. Action fans will probably enjoy this insubstantial but lively enough movie.